They’re magical, mythical, and even quite mystical. What creature are we talking about? Unicorns of course! This whimsical animal has been doing the rounds online lately, mainly due to the fact that they’re awesome and totally on-trend. I guess you can blame thank Lisa Frank for that! We’ve rounded-up 40 of the most amazing DIY unicorn crafts today to help you bring some extra sparkle into your life. From party goods, accessories, home decor, and Halloween costumes (just to name a few), there’s sure to be something here to suit every kind of unicorn lover! 2 Cats and 1 Doll has created this adorable and fluffy DIY unicorn plushie iPhone charger. You’ll find her step-by-step tutorial in this YouTube video! Here’s a great DIY unicorn party favor idea from A Bubbly Life! She has created glitter play dough and placed them within a fancy unicorn-adorned jar. A Bubbly Life has also created these awesome unicorn glitter shakers – they’re way better than your average salt and pepper shaker! Check out her full tutorial to see how she did it. Who knew you could create these amazing unicorns using just cardboard? Certainly not us! You won’t want to miss this DIY tutorial from Artful Parent. Wow, we love this DIY unicorn bust from A Ruffled Life! It’s the perfect addition to any whimsical girl’s room. Fancy creating your own DIY mini unicorn piñata? A Subtle Revelry has done just that and we think they’re adorable! This DIY 3D paper craft unicorn head not only looks easy to assemble – it’s also super on-trend! The talented girls at Bespoke Bride will show you how to make one for yourself. This is certainly the unicorn lamp of our dreams – is it yours too? We can’t believe how easy this was to create. Thanks for the tutorial Brit + Co! 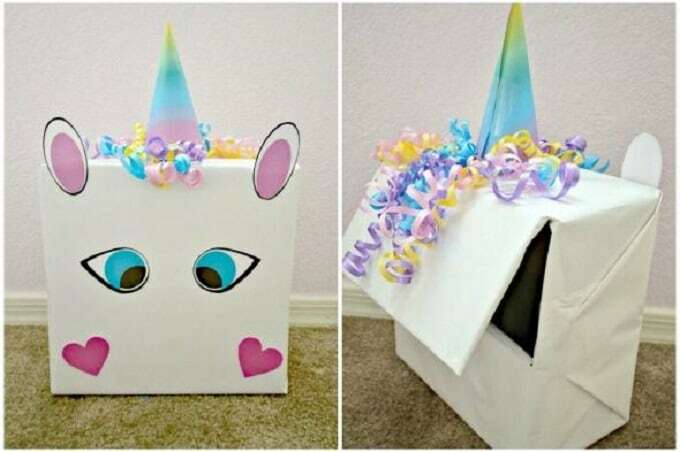 This DIY unicorn box by Celebrations was made to hold Valentine’s Day cards – isn’t that cute? Your children will love one of these in their bedrooms for holding things such as trinkets, toys, or anything else their hearts desire! Claire Sophia has shared an in-depth YouTube tutorial to help you create this DIY unicorn plush. This would make a perfect gift for loved ones! Whilst we’re on the topic of adorable things, how cute is this DIY unicorn costume by Craftaholics Anonymous? It’s vibrant and easy to wear too. Cricut will teach you how to make this sparkly unicorn notebook using their products. It’s actually a lot easier than you probably think! Here’s an incredibly cool DIY unicorn stress ball tutorial from YouTube vlogger Cute Life Hacks. We wouldn’t mind having a few of these! We had no idea that you could create something this amazing from a toilet paper roll holder! Cut Out and Keep will show you how to make this DIY cardboard unicorn via the step-by-step guide. Are you half unicorn? Damask Love believes she is, so has created this pretty DIY unicorn tote bag to hold all of her favorite stationary items. We’re in love! Here’s another DIY unicorn card holder, this time from Design Dazzle! This version is very elaborate – what a work of art! We all love the unicorn emoji, so imagine how excited we were to discover that you can make it in cushion form! DIY Lover has created an awesome video tutorial via YouTube. Girls will love these DIY unicorn horn headbands! eHow has a wonderful tutorial with step-by-step images too. Here’s some more DIY unicorn party favors, this time courtesy of Glitter Party Events and Design. Those gold unicorn jars are super stylish and children will love the glitter slime! Here’s a fun DIY craft using cardboard and ice cream sticks! Glued to my Crafts has created these unicorn heads and children will love making them too. Have you ever tried string craft before? Greggy Soriano made a fantastic unicorn picture using the art method and we love the results! Surprisingly, this DIY unicorn jewelry dish was really easy to make! Horses and Heels is the talented blogger behind this crafty idea. Here’s another whimsical DIY unicorn headband project. How To Gal created this fabulous unicorn horn and teamed it with some felt ears! If you’re willing to give felting a try (or perhaps you’re already a felting pro? ), then you’ll love this DIY unicorn project from Kawaii Felting. Don’t worry – she has a full YouTube tutorial to help you achieve this! Lia Griffith can create all sorts of things using felt, so this time she has made a DIY unicorn head on a stick. It’s the perfect toy for little unicorn lovers! Here’s another crafty felt tutorial from Lia Griffith! You can easily make your own version of this unicorn DIY by following her full tutorial. Here’s the perfect fall project for unicorn lovers – a DIY unicorn pumpkin from Lines Across! Whether you decide to use a plastic or a real pumpkin, this project will still look amazing. Can you tell that we’re obsessed with unicorn piñatas? Little Inspiration has also created a DIY version of this trend and we think it looks amazing! When the #puglife gets too much, why not throw on a unicorn costume? Live Colorful created this DIY dog costume for her pooch and it looks like he loves it! This Easter, we want to adorn our eggs in mini unicorn horns and ears! Love Vividly has created one of our all-time favorite egg DIYs, so be sure to check out her full tutorial. A unicorn necklace is the perfect accessory for any unicorn lover – just ask Make and Tell! She has created this DIY tutorial for shrinky dink plastic pendants. Here’s a DIY unicorn project of the edible kind! Miss Blueberry Muffin has created these unicorn cookies. They don’t just look scrumptious, they’re also mini masterpieces! What do you get when you cross a piñata with a unicorn with a seahorse? This DIY unicorn seahorse piñata from Oh Happy Day of course! While the combination might have you scratching your head a little, we think it’s fun, festive, and totally adorable. All hail this glittery DIY unicorn piñata makeover from Oh Happy Day! This DIY project has gone viral on Pinterest, and for a good reason too. Here’s a really pretty unicorn project that you can hang by your window. Oh Happy Day has created a stained glass unicorn and it will leave your room feeling as magical as this mythical beast! Red Ted Art is the expert at creating awesome bookmarks for your page corners. This time around, she has created a wonderful DIY unicorn version. You’ll love it! Now that is one happy dog! Sugar and Cloth has recently created this DIY unicorn pool float dog costume and we think it’s a winner for Halloween! Be sure to check out the full tutorial to see how she did it. Unicorns and washi tape…sounds like a match made in craft heaven! Totally the Bomb will walk you through the process of creating your own unicorn artwork. Thinking of throwing a unicorn party any time soon? They’re all the rage! Thankfully, if you are, Val Event Gal has created her own unicorn horn party hats, and she’s here to show you how to achieve the same results. 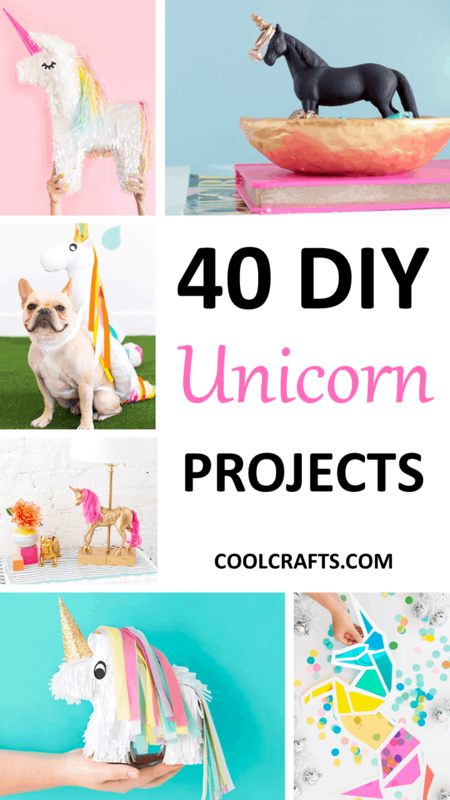 There you have it – 40 magical DIY unicorn projects that you’re sure to love! Which ones will you be creating? We’d love to hear from you in the comments section below!